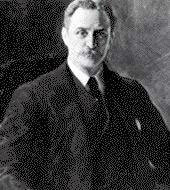 Robert Bacon was appointed Secretary of State January 27, 1909, and entered into duty the same day. Bacon had served as Assistant Secretary of State under Elihu Root prior to his appointment. He served only 37 days as Secretary of State, until March 5, 1909, when President Theodore Roosevelt left office. Bacon was born in Jamaica Plain, Massachusetts in 1860 to a prominent merchant family. He attended Harvard, where he befriended future president Theodore Roosevelt. Bacon graduated in 1880 and went on to travel the world for one year before returning to Boston to begin a successful career in business. He took part in negotiations that formed major companies, including the Northern Securities Company and the United States Steel Corporation. In 1905, Robert Bacon became Assistant Secretary of State at the behest of his friend President Roosevelt and Secretary of State Elihu Root. In 1909, after Root resigned his position, he was asked to serve as Secretary of State for the duration of the Roosevelt administration. Bacon’s business savvy aided his diplomatic efforts as he worked diligently to ratify treaties between Colombia, Panama and the United States regarding the Panama Canal. Bacon’s appointment as Secretary of State for the remainder of Roosevelt’s term was mostly due to his friendship with the President. However, he used that month wisely, successfully passing the treaties through the Senate. Bacon also convened an environmental conference between the North American states, to discuss conservation of natural resources on the continent. Bacon’s diplomatic skill was recognized by his successor, Secretary of State Philander Knox, who appointed Bacon as Ambassador to France. Years later, Bacon served under General Pershing during World War One. His military service at an advanced age put a general strain on Bacon’s health, and he died in 1919, shortly after returning to the United States. Commissioned during a recess of the Senate; recommissioned after confirmation on Dec 6, 1905.